This antibody detects endogenous levels of total PML protein. Synthetic peptide corresponding to Human PML Protein aa 39-53 (N terminal). WB: A549 cell extracts. ICC/IF: HeLa cells. ChIP:Chromatin was prepared from modified murine D3 ES cells (an in vitro model of RB1 imprinted expression was generated by integrating human PPP1R26P1 into intron 2 of mouse Rb1 in murine embryonic stem cells (mESCs)). IHC-P: Human normal colon tissue. Our Abpromise guarantee covers the use of ab53773 in the following tested applications. WB 1/500 - 1/1000. Detects a band of approximately 100 kDa (predicted molecular weight: 69 kDa). Key component of PML nuclear bodies that regulate a large number of cellular processes by facilitating post-translational modification of target proteins, promoting protein-protein contacts, or by sequestering proteins. Functions as tumor suppressor. Required for normal, caspase-dependent apoptosis in response to DNA damage, FAS, TNF, or interferons. Plays a role in transcription regulation, DNA damage response, DNA repair and chromatin organization. Plays a role in processes regulated by retinoic acid, regulation of cell division, terminal differentiation of myeloid precursor cells and differentiation of neural progenitor cells. Required for normal immunity to microbial infections. Plays a role in antiviral response. In the cytoplasm, plays a role in TGFB1-dependent processes. Regulates p53/TP53 levels by inhibiting its ubiquitination and proteasomal degradation. Regulates activation of p53/TP53 via phosphorylation at 'Ser-20'. Sequesters MDM2 in the nucleolus after DNA damage, and thereby inhibits ubiquitination and degradation of p53/TP53. Regulates translation of HIF1A by sequestering MTOR, and thereby plays a role in neoangiogenesis and tumor vascularization. Regulates RB1 phosphorylation and activity. Required for normal development of the brain cortex during embryogenesis. Can sequester herpes virus and varicella virus proteins inside PML bodies, and thereby inhibit the formation of infectious viral particles. Regulates phosphorylation of ITPR3 and plays a role in the regulation of calcium homeostasis at the endoplasmic reticulum (By similarity). Regulates transcription activity of ELF4. Inhibits specifically the activity of the tetrameric form of PKM2. Together with SATB1, involved in local chromatin-loop remodeling and gene expression regulation at the MHC-I locus. Regulates PTEN compartmentalization through the inhibition of USP7-mediated deubiquitinylation. Note=A chromosomal aberration involving PML may be a cause of acute promyelocytic leukemia (APL). Translocation t(15;17)(q21;q21) with RARA. The PML breakpoints (type A and type B) lie on either side of an alternatively spliced exon. Interacts with PKM2 via its coiled-coil domain. Binds arsenic via the RING-type zinc finger. Ubiquitinated; mediated by RNF4, SIAH1 or SIAH2 and leading to subsequent proteasomal degradation. 'Lys-6'-, 'Lys-11'-, 'Lys-48'- and 'Lys-63'-linked polyubiquitination by RNF4 is polysumoylation-dependent. Undergoes 'Lys-11'-linked sumoylation. Sumoylation on all three sites is required for nuclear body formation. Sumoylation on Lys-160 is a prerequisite for sumoylation on Lys-65. The PML-RARA fusion protein requires the coiled-coil domain for sumoylation. Desumoylated by SENP2 and SENP6. Arsenic induces PML and PML-RARA oncogenic fusion proteins polysumoylation and their subsequent RNF4-dependent ubiquitination and proteasomal degradation, and is used as treatment in acute promyelocytic leukemia (APL). Phosphorylated in response to DNA damage, probably by ATR. Acetylation may promote sumoylation and enhance induction of apoptosis. Nucleus > nucleoplasm. Cytoplasm. Nucleus > PML body. Nucleus > nucleolus. Endoplasmic reticulum membrane. Early endosome membrane. Sumoylated forms localize to the PML nuclear bodies. The B1 box and the RING finger are also required for this nuclear localization. Isoforms lacking a nuclear localization signal are cytoplasmic. 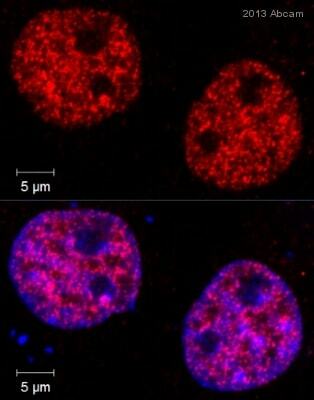 Detected in the nucleolus after DNA damage. Sequestered in the cytoplasm by interaction with rabies virus phosphoprotein. ab53773 (1/200) staining PML protein in HeLa (Human epithelial cell line from cervix adenocarcinoma) cells (green). Cells were fixed with methanol, permeabilized with triton X-100/PBS and counterstained with DAPI in order to highlight the nucleus (red). Please refer to abreview for further experimental details. ab53773 staining PML in human normal colon tissue. Staining is localized to the nucleus. Left panel: ab53773 at 4 µg/ml. Right panel: Isotype control. Sections were stained using an automated system at room temperature. Sections were rehydrated and antigen retrieved with the EDTA pH 9.0 buffer. Slides were blocked in 3% H2O2 in methanol for 10 minutes. They were then blocked for 10 minutes (containing casein 0.25% in PBS), then incubated with primary antibody for 20 minutes, and detected for 30 minutes. Colorimetric detection was completed with diaminobenzidine for 5 minutes. Slides were counterstained with hematoxylin and coverslipped. Please note that for manual staining we recommend to optimize the primary antibody concentration and incubation time (overnight incubation), and amplification may be required. Publishing research using ab53773? Please let us know so that we can cite the reference in this datasheet. There is no image of any western blot on mouse tissue on your website. This is a real key question, as we tested a couple of antibodies, none of them worked correctly on mouse brain tissue, analyzed by western blot. Can you provide me with a western blot from mouse tissue? Could you give me more information. What is the money back warranty on this antibody? What is the sequence of the immunogen peptide? to which region (aa number) does it correspond? looking forward to your answer before placing an order. J'ai compris que vous aviez rencontré des difficultés avec deux anti-PML et j'aimerais donc vous rappeler que nos produits sont garantis pour fonctionner tels qu'ils sont décrits sur la fiche technique et que nous pouvons donc toujours résoudre un problèmeen vous remboursant, vous faire un avoir, ou vous envoyer un produit de remplacement. Je serai ravi de vous apporter une solution rapide à votre problème. Autre point, le laboratoire qui produit l'anticorps anti-PML ab67761 m'a informé que malheureusement aucune image Western Blot n'est actuellement disponible. Si vous souhaitezutiliser ab67761 en Western Blot, il me sera possible de vous offrir une offre promotionnelle. Après achat de l'anticorps et l'envoi d’une Abreview avec vos résultats, vous pourrez commander gratuitement n'importe quel anticorps primaire de notre catalogue. 1. Nous confirmer que vous souhaiteriezutiliser ab67761en Western Blotafin de recevoir le code de remise correspondant. Important, ce code doit être édité avant l’achat de ab67761. 2.Commander ab67761par téléphone, fax ou internet (https://www.abcam.com). Inutile de mentionner le code sur cette commande. Merci de nous avoir contactés et désolé pour le délai de ma réponse, j'attendais après le laboratoire les réponses à vos questions. Concernant l'immunogène : l'information sur la fiche technique est incorrecte. Le peptide utilisé correspond à la régioninterne (entre les acides aminés 400et 500) et non àla région N-terminale. Nous sommes désolés pour cette erreur, la fiche technique va être mise à jour avec la bonneinformation. J'attends malheureusementtoujours l'image Western Blot pour cet anticorps. I have attached customer's file. Please find her data and check the results. I am sorry to hear the suggestions made have not improved the results on this occasion. I appreciate the time you have spent on these experiments and would be pleased to arrange afree of charge replacementor credit note in compensation.